individual winter root vegetable souffles. The one thing I’ve noticed since I started writing for Feast is that I look at the magazine from a different perspective than I used to. Unavoidable, perhaps, because now I know them and talk to them, and they’re real people to me, whereas before they existed only in the abstract. So the magazine, for me, has become a way to see what all the other kids’ assignments were for that month. When it comes out, I look through it to see what everyone did, and how it all came together into one finished piece. On one hand, it’s a cool perspective to have, because you get to see people’s work more as an extension of who they are, and as a way of getting to know them. The downside of this is that I don’t ever seem to just thumb through it like I used to, seeking out what I may like to make from the plethora of recipes showcased each month. I miss doing that. This month, one caught hold of my thoughts and wouldn’t let go. 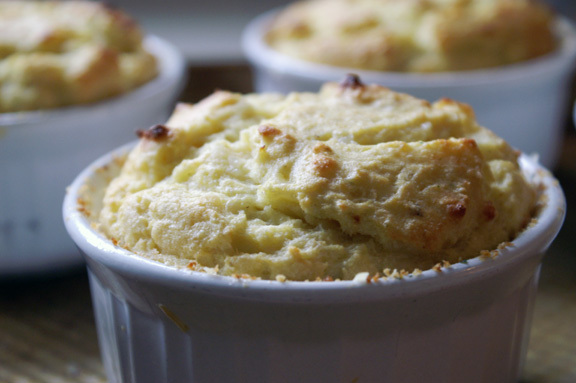 Individual winter root vegetable souffles; it’s like the most perfect winter recipe ever. I first saw it as it was snowing and quite possibly 30˚F below outside, and I was camped out under a blanket shroud, which made it seem like an even better idea. 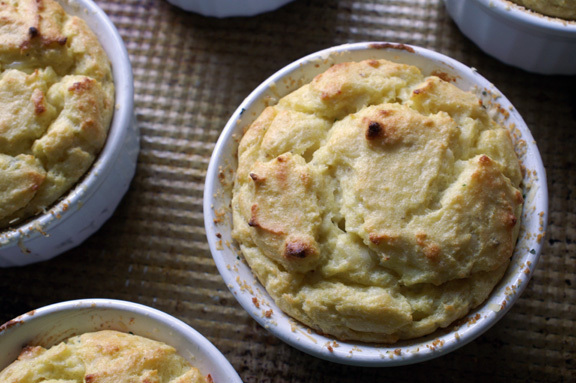 Friends, these wee souffles are overflowing with roasted root vegetable flavor. 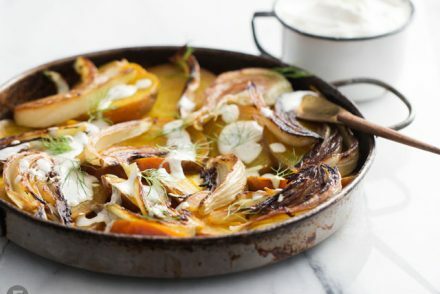 Celery root is glorious all by itself, but roast up some fennel, parsnips, a few shallots and some garlic along side of it, and it creates this huge, multi-layered flavor that’s supremely comforting. Truth be told, I was making these just for me, but I realized early on that I’d need to share them with you. For whatever reason, even really before I knew what I was doing, I’ve had a knack for souffle-making. It’s always the weird, semi-useless things I excel at: Can I make bread? Barely, but boy can I whip out a souffle if there was ever an apocalypse and anyone needed nourishment. These souffles worked beautifully, but for any souffle newbies or scary-cats out there, it’s not the easiest one ever to tackle. Root vegetables are heavy by nature, and you’re roasting and blending them into what is basically a semi-chunky paste, adding some bechamel sauce (also not the lightest of things), some cheese and egg yolks, and then attempting to gently fold in egg white clouds. It totally works, but it requires patience, a slow hand, and a dedication to thoughtful folding. If you can do that, then you can make this. Did I mention that all your hard work will be rewarded with heavenly smells in your kitchen – twice over – and some really outstanding souffles. The nicest thing about having individual ones is that they’re still fully put together when you go to warm them up the next day (assuming you have any left), which they do rather well. I would know, because this week there was 1 of me and 8 souffles, so I’ve had several chances to hang out with these. They’re great alongside a salad, or a protein; whatever you think is best for you. As a side note for the locals, the Riverfront Times just announced their 7th annual Iron Fork event, happening March 20. I’m looking forward to attending this year, and if you’d like more info, head over to their microsite to find out what it’s all about. They’re running a pre-sale on tickets until January 16th at 10 pm (that’s tomorrow, friends! ), so head here and enter the word TABLE in the promo code section to take advantage of the pre-sale-ness of it all, and I will see you at Iron Fork 2014. Adapted only very slightly from Lucy Schwetye’s brilliant recipe for Winter Root Vegetable Souffles in the January 2014 Feast Magazine, and found in its original format right here. If you’d like a little visual aid, this is the recipe featured on this month’s Feast TV, so watch the episode for some step-by-step guidance through the more difficult parts. makes 8 individual souffles: you’ll need 8 8-ounce ramekins for this. 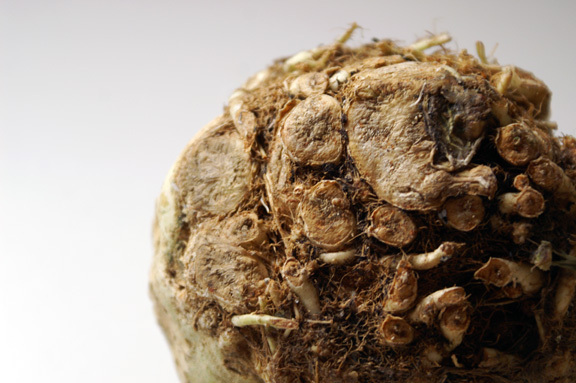 *Most of you probably know this, but celery root and celeriac are the same thing, just like how Jerusalem artichokes are also called sunchokes. I enjoy saying celeriac, because it always sounds like I have a disease, like “So what does she have?” “The doctors say they need to run more tests, but she may have a case of Celeriac’s.” “(gasp) oh, noooo…” So, anyway. Things with weird names make me feel good inside. To prepare the ramekins, stir together bread crumbs and shredded parmesan cheese. Grease bottom and all the way up the sides of each ramekin, then coat completely with the bread crumb mixture, shaking out the excess. To make it slightly less messy, work two at a time, shaking the bread crumb mixture between two ramekins (bound together tightly with your hands) like your favorite bartender shakes a cocktail. Repeat. Preheat oven to 400ºF. Line a lipped sheet pan with aluminum foil. In a large bowl, toss root vegetables in olive oil and season generously with salt and pepper. Spread in a single layer on prepared pan and roast uncovered for 20 minutes. Cover with another sheet of aluminum foil and roast another 10 minutes. Remove from oven and allow to cool slightly. When vegetables have cooled enough to touch, place them in a food processor. Process vegetables, scraping down sides of food processor occasionally to catch any chunks that escape the blade. Don’t worry about the mixture having a few small chunks: that’s to be expected, and it will be very thick, almost like a paste. Add vegetable stock and pulse until blended. Transfer to a medium bowl and season again with salt and pepper, as needed. Set aside. In a small pan, melt butter over medium-low heat. Once melted, stir in flour with a whisk and cook for several minutes, stirring constantly. Pour in the milk slowly as you whisk; mixture will thicken almost immediately. Stir until smooth, then season with sea salt and pepper and set aside. If your bechamel looks to thick here, that’s okay: add a few tablespoons of milk and whisk until completely incorporated; it should loosen right up. You want it thick and smooth, but not pasty, because that would be hard to work with. Think of a sponge cake batter; that’s about the texture and pourability you want. In a large bowl, whip 7 egg whites until stiff peaks form and set aside. Add the egg yolks to the vegetable purée and mix well with a spatula. Stir in the béchamel, then add the Gruyère. Take 1/3 of whipped egg whites and fold them gently but firmly into the vegetable mixture. We have talked about folding at length here on several occasions, but I’ll remind you once more: slow and steady actually does win the race here. Make each stroke count, and don’t try to hurry things along. Scoot that spatula down all the way to the bottom of the bowl, and lift up and over. Rotate the bowl a little to get the best angle for you, then do it again. As things start to work in, start eyeing where you see little cloud bits of egg white, and make sure you fold those in as well. Don’t press down and don’t hit the bowl with the spatula along the way; both of those actions can easily deflate all your hard work with those egg whites. Fold in the next 1/3 of egg whites until almost incorporated, then fold in the remaning whites. Divide mixture evenly among prepared ramekins. Bake for 25-30 minutes, checking at around the 22-minute mark to see how the look: when done, their tops should be crackly, puffed, and lightly golden. Remove from the oven (carefully!) and serve immediately. Side note: if you don’t want to mess with eight little ramekins in your awkwardly large, be-mittened hands, I get it. Do what I do and place them all on a sturdy lipped baking sheet. That way you can lift them in and out of the oven without burning yourself, knocking into the other ones, or deflating anything. Also, the lipped part of things makes for good accident prevention in case you angle it and things start to slide. 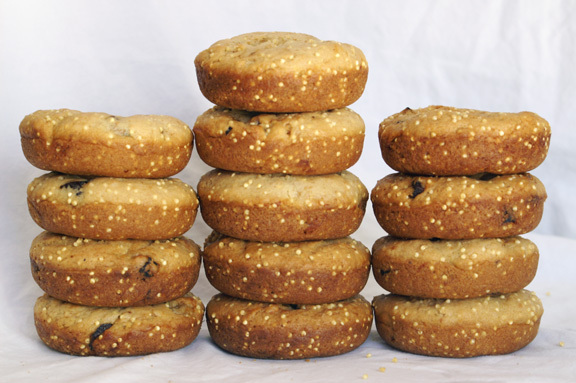 [virtuous] fig + millet donuts. roasted beets + fennel with tahini-dill dressing. 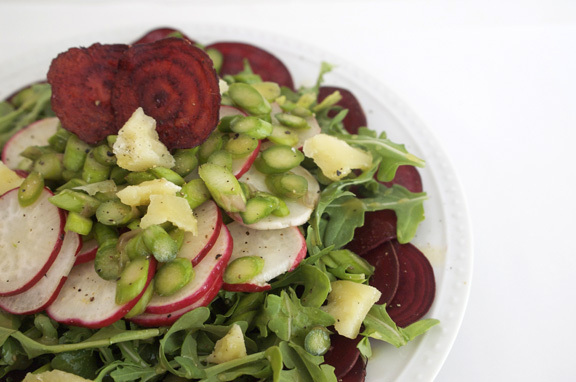 farmers’ market mondays: spring vegetable salad + honey lime vinaigrette. I ALWAYS THINK THE SAME THING! “Celeriac soup? Is it contagious?” lol! Sorry I’m so rambly today but YOUR SOUFFLE LOOKS GORGEOUS! I don’t know if I’m quite ready to gradulate to root vegetable souffle but I might have to give it a shot. I wish there was a local magazine that I could contribute to (that wanted me) (and that I had time to contribute to). You are lucky! Wow, this looks so good! I did see this in Feast and thought what I always think when I see this recipe: I really need to make it! I’ve had this on my radar screen for what seems like forever (years), but haven’t gotten around to it. Maybe this year? Who knows, but you’ve sure inspired me. Love the light on the top photo, BTW. Really nice post – thanks. Things with weird names also make me quite happy. Which is good, because the fly proteins I study can have some of the strangest (but also hilarious and way more fun than their mammalian counterparts) names — Insensitive, SPOC, and the always fun (though I, sadly, don’t work with it), Couchpotato, Mindbomb, Neuralized, Frizzled….. You get it. So fun! Even when abbreviated (I call one T-rex because it’s abbreviation is Trx). And these souffles sound perfect for days like this, when it’s a snowglobe outside my window. Want. Now. PS – your souffle making skills are totally welcome to save me during any and all apocalypses. I’ll even trade you the results of one of my “useless” skills. Couchpotato? MINDBOMB?!? this is the most awesome thing i’ve ever known about fly proteins. I am honestly so lucky to know those of you who study things like this. I’m not even kidding about that. I love it. We also have been having some minor snowglobe action going on here…random acts of flurry right now, but i think we’re getting more tomorrow. Last week when it was super cold? it was great to heat these up for meals…so comforting, and every night i’d make a new vegetable or something to go alongside it. It was almost like having someone else make me souffle for dinner (since the labor had already been done in the initial baking of them), which is always a nice bonus after a long day. This is good to know: i’ll happily trade my souffle skills for one of your useless skills during any apocalypse. We got this. Souffles are not something I have made before! I might need to put those pretty little ramekins (that are languishing in the cupboard) to a good use. Adding this magnificent winter recipe to my “must make” list! Why has no one here made a souffle! 🙂 I know all of you are easily talented enough in the kitchen to do it, and they’re so nice every once in awhile. I think i like them mostly because they’re a “mother recipe” of sorts: once you know the basics, you can think of all sorts of flavors to add in. Don’t feel too bad about ignoring your ramekins; 99% of the time, we’re using them for sauces or dips. Very unglamourous. Swear to you, i hadn’t even read your comment yet when i answered Monica’s, and i recommended the very same Cook’s Illustrated/ATK souffle! That one is solid: I do recipe-testing for them (you sign up for it and they send you things to test and give feedback on, nothing serious), and it’s probably the best recipe i’ve texted from them so far. Don’t be terrified; you can do it, i know you can. The CI will be a good confidence-booster, because it really comes out well. isn’t it nice that souffles always taste good, even if they fall apart? It’s the least they could do, i think, for all the work people put into them. 🙂 Make one; you can do it! Look on the America’s Test Kitchen site (i’ll try and look later as well) because they have a fantastic, very simple cheese souffle recipe that works wonderfully and is delicious. I recipe-tested it over the summer so i know this personally; it’s very forgiving, and it’s one big one, but i bet you could make it into small ones easily. Or make this one, if you really want to go for it: the flavors are incredible, and it’s nice to eat something loaded with root vegetables right now. Oh I love using celeriac (and love saying it too- always gets the response, “huh??”). Sure is one ugly veg though isn’t it? ha! it’s fun to through people off with it, especially if you just drop it into a conversation about normal things; people are all “wait what was that you just said?” 🙂 i think it’s one of those things that’s so ugly it’s a little attractive, in a way? i think it’s all the dirt and texture in it: they’re gnarly, and sometimes there’s a beauty to it…in a totally hideous way. i always wonder with things like that who was the first person who thought it would be a good idea to try and eat it. total yay for souffles. always. I love these! I always use celeriac and parsnips when I make chicken soup. They are the first things I munch on while i am taking the chicken off the bones. Now I can think of a way to use them. These look great and I AM NOT AFRAID OF SOUFFLES! But I do have a frozen cheese souffle on my blog that is awesome. And no whipping egg whites, for those folks who are afraid of traditional souffles, this is perfect! aren’t they wonderful things! 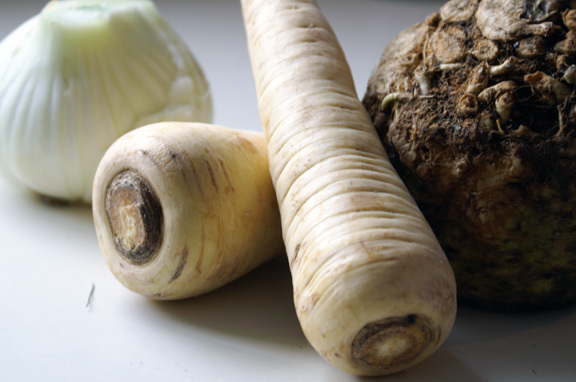 too few people know the wonders of parsnips and celeriac, for sure: their flavors are so lovely. I love it when people see that souffles don’t have to be hard (i love those easy ones like the one you have where it’s not as labor-intensive and not as scary), because those can be a nice ice-breaker into making them in general. I think everything is scary with cooking the first time you do it: EVERYTHING. Which is why you just have to do it, right? I certainly don’t see souffle-making as semi-useless! You never know when you might need a good souffle to save the day. blood orange + rosemary cake.